Designed in the Shaker tradition, our Seven Drawer Dresser is free of ornamentation, with exposed dovetail joints, spectacular wood grains and a subtle hierarchy of ascending drawer heights. 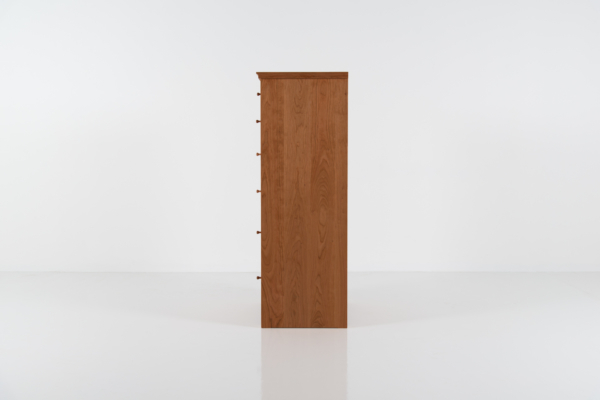 We have crafted the exterior panels and drawers to accommodate temperature and humidity fluctuations that cause wood to expand and contract. 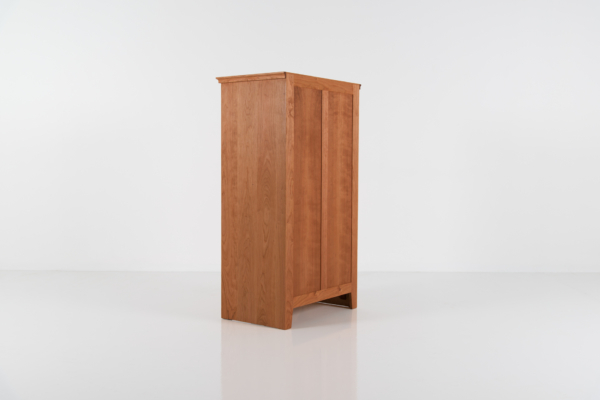 Although conservative in its footprint, the dresser’s design is roomy and organized, providing ample room for an assortment of items, organized for easy access. The Seven Drawer Dresser shares its lineage with early Shaker designs. 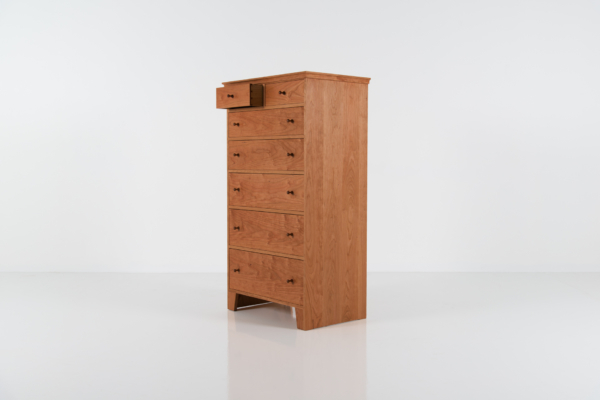 Made of a hardwood of your choosing, the dresser features five spacious lower drawers and a pair of smaller drawers at the top. 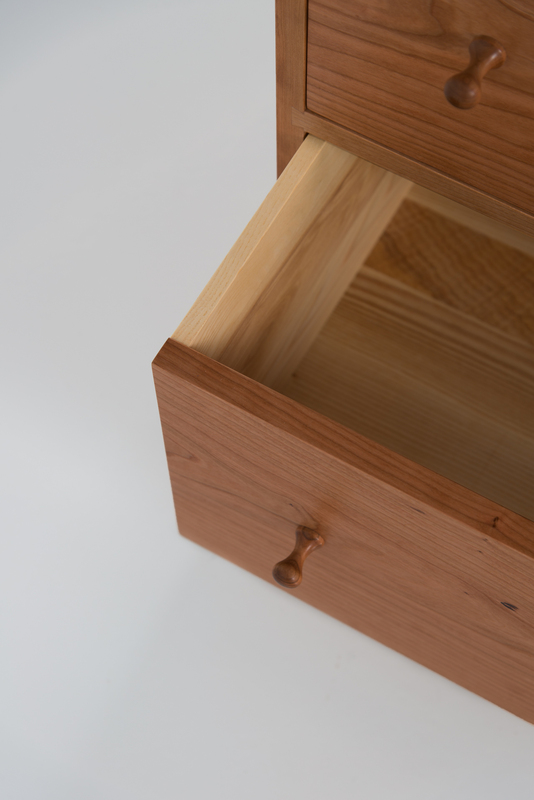 The design is intentional, and allows for easy segregation of – and access to – everyday items. 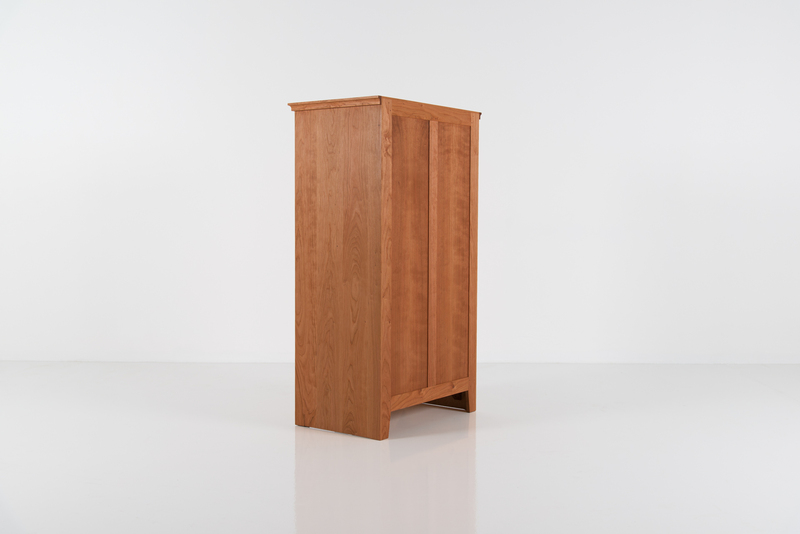 With a wide top that extends beyond the case, the chest’s linear form is captivating and fits well with any choice of bedroom furnishings. 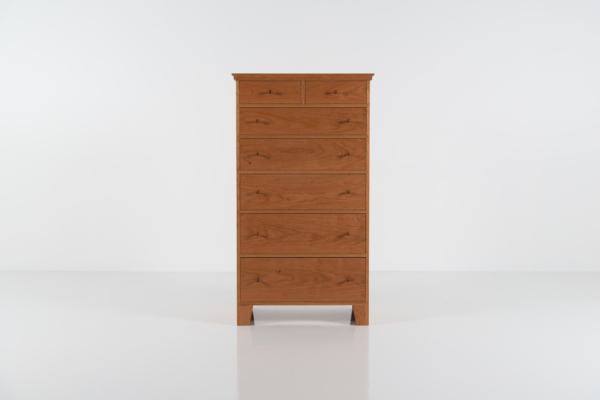 The dresser’s unique drawer arrangement enhances its visual appeal, with single plank faces accessible by hardwood knobs. The drawers move with ease on our trademark slides of solid hardwood regardless of atmospheric conditions. 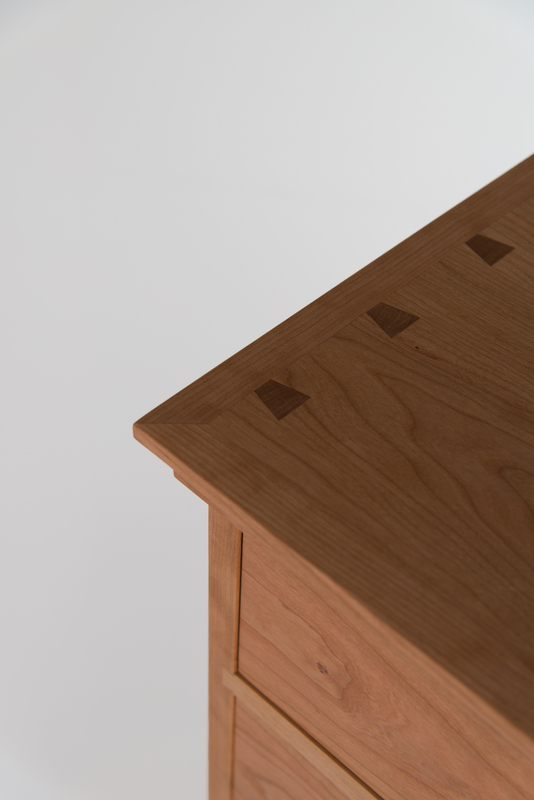 The drawers close nearly flush with the cabinet face, resting neatly in their precision housing to create the illusion of a broad, almost uninterrupted front. 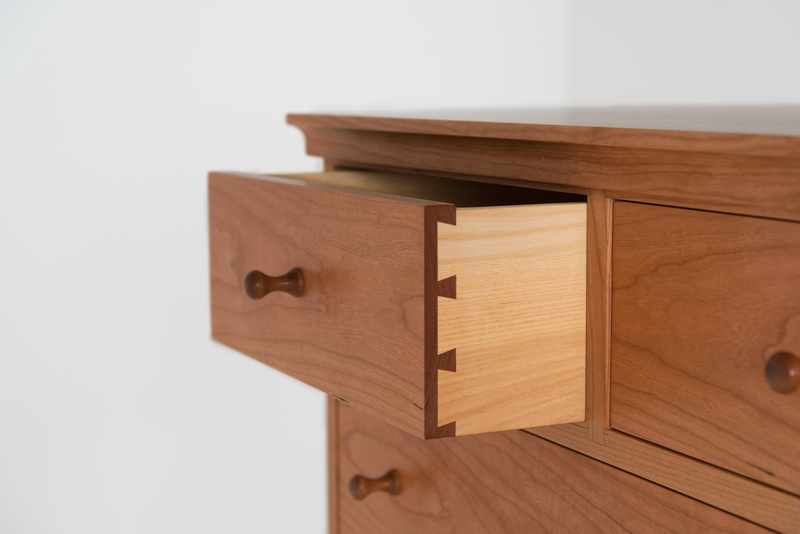 The Seven Drawer Dresser rests on a pair of feet that span its depth, secured to the sides using traditional mortise-and-tenon joints, leaving a visible opening in between. The top is connected by exposed dovetail joints, and its aesthetic is enhanced by its subtly-tooled edge, which eases the transition to the cabinet.